The Liberty League arrives in the Danger Zone where they come to the assistance of Red Giant, helping her fend off an attack by the Rats. With Star still wheelchair bound from recent injuries, she would have been overwhelmed by the villains had the rest of the heroes not arrived. Red Giant confirms that this region of Chicago has got even more dangerous recently as the Danger Zone’s territory diminishes and its super-powered residents become more desperate. Dragon asks Mighty Man to keep an eye on things while he takes his allies into Red Giant and Star’s home to reveal the reason why he brought them all there. He explains how President Bush possibly led his family into a death-trap and feels that his own home may not be safe to discuss such matters. Mister Glum suggests beheading Bush and mounting his head on a pole to not only punish him but also warn away any other potential threats. Battle Tank takes Glum away with Angel, allowing the discussion to continue without anymore inappropriate interruptions. Jennifer Dragon cannot believe that everyone is accepting her husband’s theory that President Bush just tried to kill them. Glum assumes that the heroes are all conspiring against him and that is why he was removed from the conversation. Battle Tank suggests to Angel to calm her friend down but as he starts ranting about wanting to kill them and roast their corpses, Angel feels that he is going to be just fine. 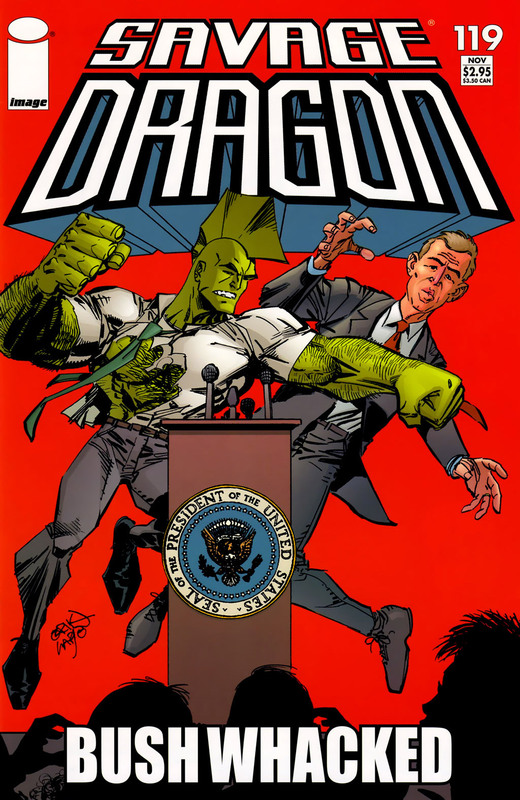 Despite the concerns of his wife, Dragon opts to confront President Bush and expose him for his part in the recent attack. Rex Dexter gives him a device that should help prove his theory whilst Jennifer kisses her husband goodbye, not wanting him to think she was mad at him. As Dragon approaches the latest location of Bush on his campaign trail, his flying car is shot out of the sky by Tiger. She is now heading up the S.O.S. and the government super-team announce that they cannot let him get close to his target. A television address is made by President Bush where he comments on the times that Dragon has saved the entire planet. He then declares that something has changed and that Dragon has now gone crazy and is trying to kill him. Bush claims that Dragon must be stopped by whatever force is necessary even as the S.O.S. do their best to halt his path. The heroes are eventually defeated and Dragon reaches the President at which time he fires the weapon that Rex gave to him. The gunshot misses President Bush but it momentarily causes his form to alter to that of Imposter, a shape-shifting villain. Dragon pins Imposter and forces him to reveal his true identity before extracting t he location of the man he replaced. The Liberty League attacks the terrorists responsible and quickly has them in their custody, releasing President Bush in the process. 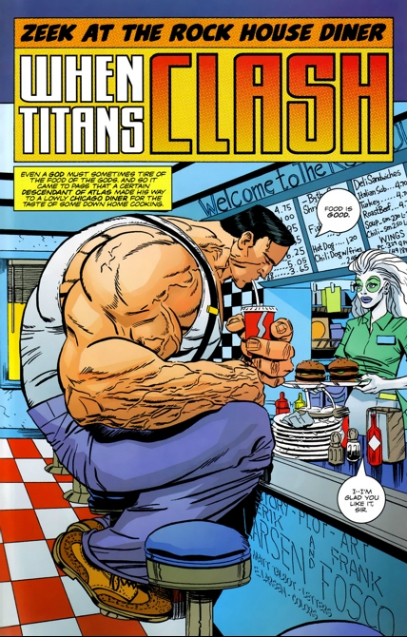 In the Rock House Diner, the muscle-bound Zeek feasts upon a huge meal that he enjoys but once he finishes, he simply walks out of the restaurant. Widow quickly calls out to Rock in the kitchen to let him know and her husband chases down the non-paying customer. Zeek does not understand what he has done wrong as the simple-minded hero had not realized that he would need to pay for the food. Rock assumes that Zeek is one of the Vicious Circle out for a free meal and attacks him, unwilling to let the word go out that his business is ripe for exploitation by the villains. Zeek defends himself and a huge fight commences that causes all kinds of destruction outside. Rock does his best against his vastly stronger opponent but it soon becomes clear that he cannot hope to win. Rock refuses to stay down though and keeps rising to his feet to continue the battle. In an effort to calm things down, Widow leaps in between the two combatants and points out to Rock that Zeek simply did not understand the situation. Zeek ultimately agrees to stop fighting and he goes with the couple back to the diner. Rock has Zeek clean dishes for him as a way of paying off his debt, warning his temporary employee not to break anything or there will be consequences.